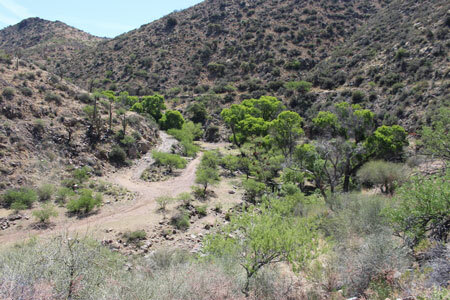 Copper Creek is an old mining camp located along the creek of the same name in southern Arizona. It is approximately 10 miles east of the small town of Mammoth on the western slopes of the Galiuro Mountains. I grew up about 20 miles to the north and spent a lot of time walking and driving around in the area in the 1970's and 1980's. One of the last times that I was there was in 1989, when our family backpacked our 4 year old daughter into the area. I recently had the chance to bring her back. 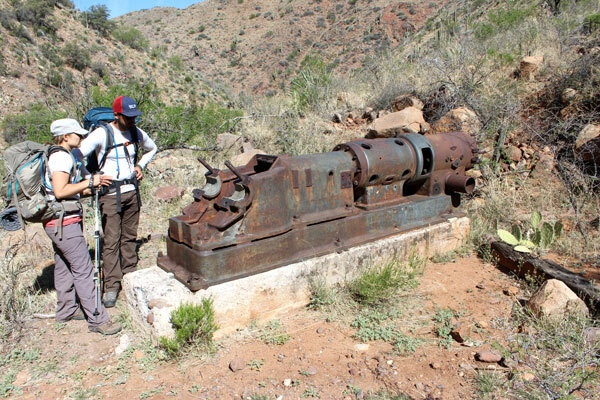 The history of mining in the area dates back to the 1880's. By 1910 there was a post office, and several stores that served a population of 200 miners and their families. 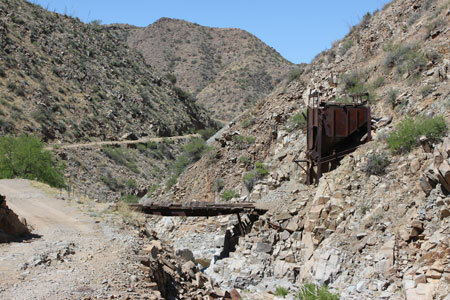 A short line railroad was installed to haul ore two miles from the mine to the mill. In later years there was telephone service, an ice plant, cafes and theaters. In its heyday, there may have been as many as 500 persons living in the camp. The post office was open until 1942. While a lot of money was spent over the years, the mines were never really profitable. Today, there are a few concrete foundations and the walls of a couple of stone buildings that remain. 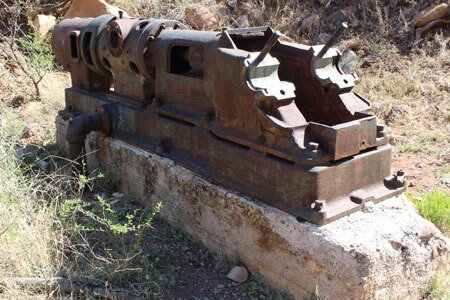 In the 1970's a leaching operation was conducted at one of the old mines. The settling ponds remain from those days. Until recently, exploration drilling was being conducted. There could be future development. 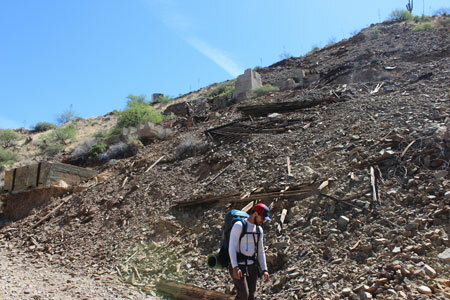 The outstanding structure still standing is a couple of miles up the canyon from the obvious mining areas. It is called the Sibley Castle or the Sibley Mansion. 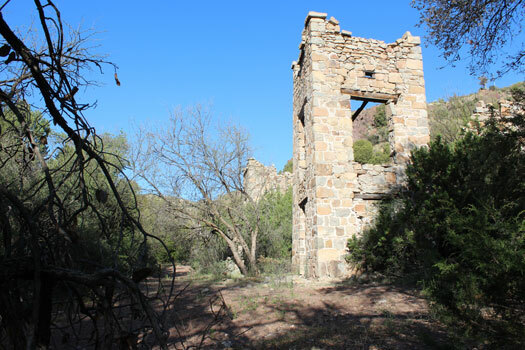 This large house was constructed in the early 1900's by mine manager R. Roy Sibley to impress investors interested in backing the mining operations located further down the canyon. However Sibleys occupation of the home lasted a couple of years and in 1910 Roy Sibley joined the big house at San Quentin for embezzlement....When World War I came around all of the furnishings, flooring and other valuables were stripped and the building became just a shell"
I have not been able to confirm Mr. Sibley's conviction for embezzlement and sentencing to San Quentin Prison. Many references to Roy Sibley describe him as a hard-charging, party guy. He and his wife were supposed to have had the reputation for throwing lavish parties at their mansion with guests(potential investors) coming from all over the country. Mr. Sibley supposedly kept a road crew on duty at all times in case he had problems while blasting around in his Stutz Bearcat. 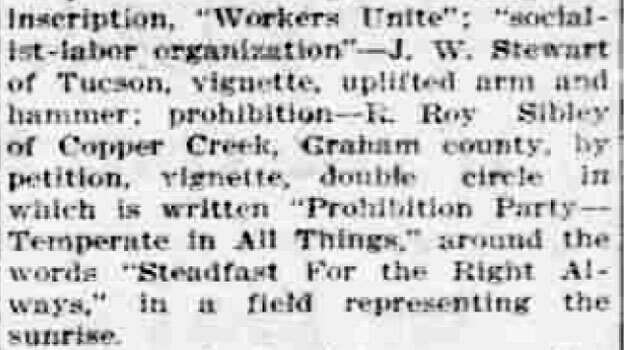 That image of the mine manager contrasts sharply with the one that comes to mind in a December, 1908 Arizona Republican newspaper article listing the 6 political parties and their candidates for congressional delegate. R. Roy Sibley of Copper Creek was listed as the candidate to represent the Prohibition Party in the upcoming election! I would not associate a representative of that particular party with one who had the reputation of being a hard charging party animal. That the town never had a saloon also fits more nearly the image of the prohibitionist Sibley. Martin E. Tew became the mine president/manager after Sibley. 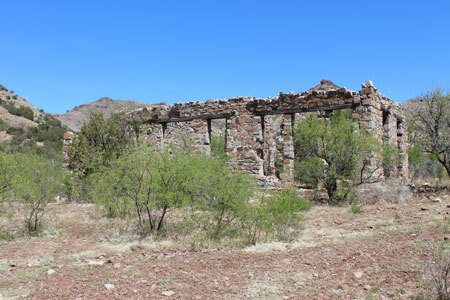 In addition to looking after the mine properties, he created a ranch that incorporated the Sibley Mansion. The ranch was known as Monte Bonito. Tew would remain in the Copper Creek area until his death in the 1940's. 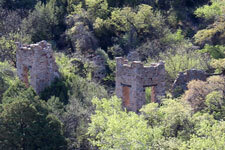 I remember the perimeter walls of the Sibley castle still standing in the 1970's. 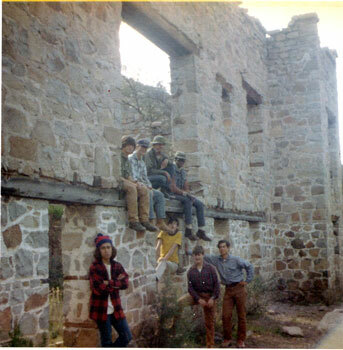 This photo taken around 1971 shows that the front wall of the mansion was still pretty much intact. That was not the case when we returned recently. The front wall was no longer standing. I do not think that the collapse was necessarily due to any vandalism. Perhaps the wooden beam supporting the wall had simply rotted away, dumping the second story onto the ground. Near the Sibley Mansion, are the stone walls of the old mine office/mine store. It was apparently kept in use long after the Mansion had been abandoned. Wooden lintels were also used in the construction of this building. How long will they support the upper walls? 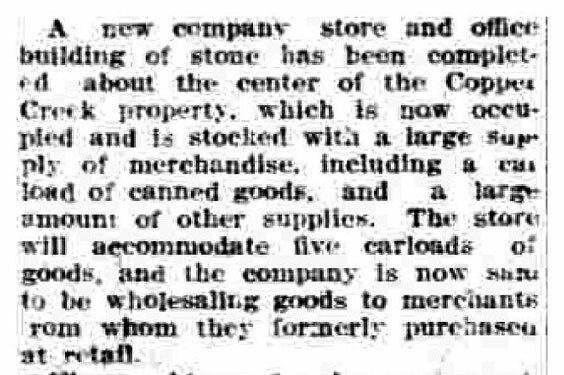 A December 1908 article in the Arizona Republican seems to reference the recent construction of the store. I was not able to find any similar reference on the construction of the Sibley Mansion. Mr. Rowe has a website that shows vintage photos of the store and includes photos of the railroad. It can be found here. property and that entry was prohibited! We saw no signs like that anywhere. readers to make this same trip. 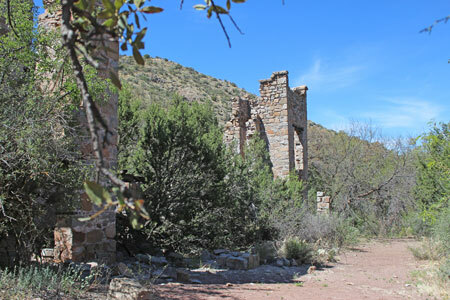 Below the area of the Mansion and the old store, there are a few remains of the old mining operations. 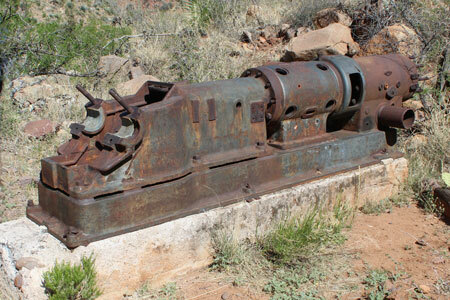 The only piece of equipment that I have come across in the area is this old compressor. 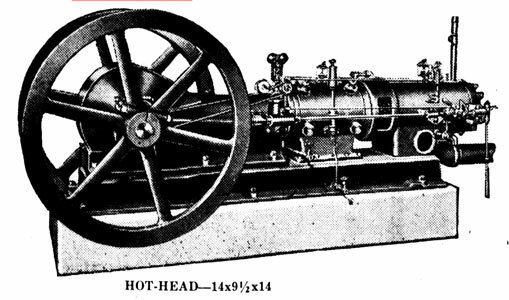 While there are no nameplates on the old machine, it appears very similar to Chicago Pneumatic fuel oil powered compressors sold in the 1920's. 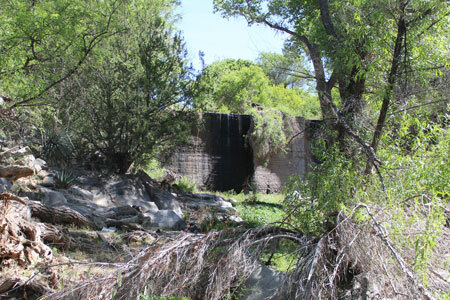 Nearby is an old concrete dam that according to Mr. Rowe once backed up a reservoir of 8 million gallons. 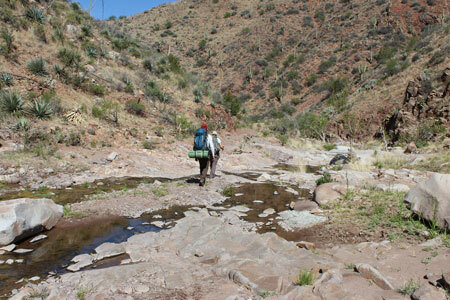 The water was used in the mining process and the area was a recreational site for the local folks. From a photo in the book of the reservoir, it is possible today to identify the routing of the old railroad bed in the area. The old concrete dam is just out of sight beyond the bend of the creek in the distance. The almost level "road" in the distance is the old railroad bed. Beyond the photo to the right was the old mill. Beyond the photo to the left was the mine. The railroad crossed the creek somewhere above the dam. Lumber and concrete foundations are pretty much all that remain of the old mill. The Rowe book has an excellent photo of the mill in its operating condition. 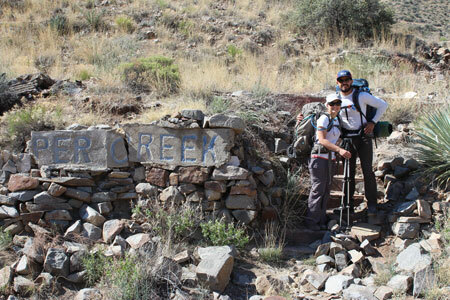 For many years there was an intact "Copper Creek" sign. It was located at the base of the steps to the old Post Office. Today, the sign is not so complete. Along the Copper Creek Road, there are several bridges that cross the narrow canyon. I am not certain what era of mining that they belong to. In the 1970's and 80's, Copper Creek could be easily accessed on a decent dirt road from Mammoth. Once at the town site, it was possible to drive(4WD) as far as the mansion. Today, the rough road starts once you enter the canyon. 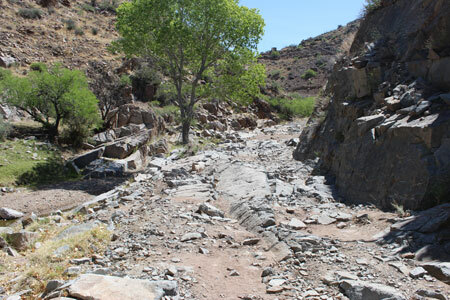 The photo below is a section of the road near the old mill. We had come to walk the area, so this was a good spot for us to start. 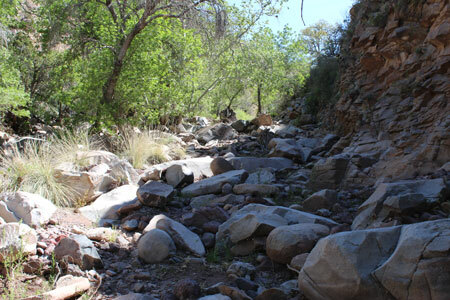 From the old dam upstream, the road no longer exists. I understand that the damage was done by flooding in 2012. 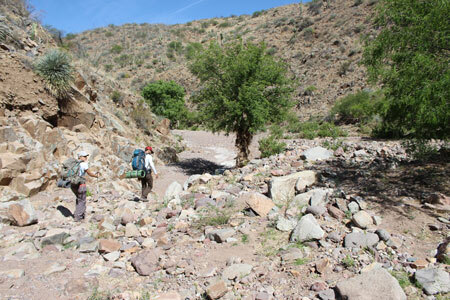 To see other effects of this flooding, take a look at another recent trip to the lower box canyon of Copper Creek. Click here.